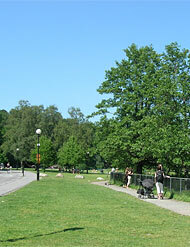 In Gothenburg you will find some green and nice parks to go for a walk in. You will find their location at different places in town. Take a stroll in some of Gothenburgs parks. During your stay in Gothenburg it can be nice with a small break from the city and go for a walk in the verdure. In the summertime you can bring a picnic and a blanket and if you want to be active, bring a ball or maybe a bat to play some rounders with. Calm down in the parks and have some peace and quit. Before it became Slottskogen at the 1880´s, it was simply a big forest with trees and wild animals. In the 1600´s people went here to breathe in the fresh air and enjoy the forest. It was August Kobb who founded the park - you will find him carved in one of the flat rocks below the slope from the seapond. Today there are no wild animals in the park, but on the other hand a small zoo were you among others can see: elks, peacock, sheep, pigs, horses, deer etc. Don´t miss the seal- and penguin pond. In Slottsskogen you will find ponds, beautiful trees, open lawns, groves, cafés, restaurants, hot-dog stands, beachvolley grounds etc. You can also visit the viewpoint, the watertower that is located 282 feet above sea level or the old ski jump - 249 feet above sea level, there you also will find a view point. In the park you will find lime, oak, elm, ash and maple. Slottsskogen have trees that is 200-300 years old! Trees and bushes from different countries around the world: the two serbian spruces in front of the Tropic house and in the valley - Azalea. What can you more find in the park? In the park you will also fint the museum Naturhistoriska museet, Observatoriet (were you can look at the stars in the sky), nice small houses from different areas in Sweden, the small Police museum, the Church (summertime), miniature golf (summertime) and a frisbeegolf court. How about the penguins at wintertime? The penguins are inside in the bird house, were they actually have access to heat......The seals are in their pond the whole year around. Restaurant and cafe located in front of the the big pond. In Summer you sit outside in their charming garden. Pastry and light food are served all year around. 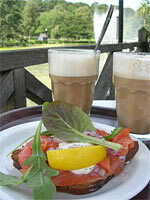 A lovely summer day we ate their good salmon sandwich and coffee, we also had carrot cake, yummy! 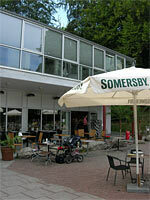 Restaurant and cafe adjacent to "Slottskogsteatern" and "Domen Konstskola". In summer you sit outside in front of the house. One summer day, you can go here and try their ice creams. Also waffles and easy dishes. The atmosphere is not exactly cozy - but still, nice to sit and look out over Sottskogen. Trädgårdsföreningen was ready in 1842 and became behind walls, the little paradise in Gothenburg. When it was built it was called - the Romantic Park. In Trädgårdsföreningen you will find beautiful trees, private "rooms" for some rest.... restaurants, cafe, fountains etc. In the park you will find beside the Lagerträdhuset, the bed with peony. Here you will find approx 30 different species of Peony. In Stenpartiet you will find unusual plants and bushes. Here the flowers are blooming from early Spring to late Autumn. In Doftträdgården you will find herbs and lilys etc. In front of the direktörsvillan you can see plants with cactus. In the park you can also view many different sculptures - among others - Carl Michael Bellman, the Climber, Pan, the Bride that disappeared, the Water shell etc. There is also a play ground that is equipped with some fun things - the slide is formed like a fish and give the children a feeling about diving in the big Sea. You can also visit their greenhouse - with perennials, plants from the Mediterranean, unic roses and products for the garden. For you that loves roses visit Rosariet. Today you will find approx 4000 roses with 1900 different species. A delight for the eyes and wonderful scents. In Palmhuset that was built year 1878 you can stroll around in a big big area of glass and cast iron. Inside Palmhuset of course you will find - palms, banana and giant bambu. In Kameliahuset - lilys and orchids. In Medelhavshuset - lavender, olives, dwarg palm and cactus. Fågelhuset - cacao, vanilla and papaya. Vattenhuset - swamp plants (mangrove), giant water lilys and pineapple plants. The Gothenburg Botanic Garden opened 1923 during the Gothenburg anniversary. Today it is one of the largest botanic gardens in the world and the area is approx 175 hectares (ca 430 acres). The name was already suggested in 1912 and was determined 1916. In the park you can stroll around in hilly terrain and read about and view all the many different plants, trees, flowers, bushes etc. You can walk around in the Japanes Glade, the Rhododendronvalley, perennal garden, herbgarden and Klippträdgården. In the Botaniska Trädgården you can view approx 16.000 different species outside. Approx 4.000 species are grown in greenhouses. In the park you will find among others Båtmanshuset - the blue house from 1794 - today staff building. Lusthuset from the 1700´s , Stora Änggården from 1812 - today staff building. 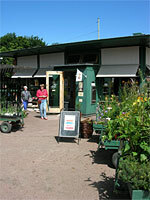 You can also get some food or a coffee in their restaurant - Botaniska paviljongen. You can shop plants and other things in their small shop. For you that are interested in art - visit their art gallery. For the children there is also a playground with among other - sculptures in the shape of dinasours. 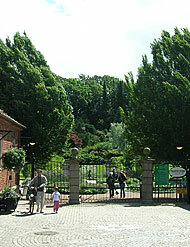 Gothenburg Botaniska Trädgård was crowned "Sweden´s most beautiful Park " in 2003.